In addition, LSE Gateways install with pMerge which is removed during a LSE Gateway uninstall. Before installing Version Version 7.X and higher, you must ensure that your machine is on a version of the Windows platform supported by TT. Please refer to the https://customernet.tradingtechnologies.com/Extranet/Downloads/Documentation/Hardware_Software_Requirements_V7X.pdfTT Trading Systems - Hardware and Software Requirements Version 7.X document for details. If you previously installed TT software onto your machine, the gateway software automatically installs to the same drive. Depending upon the environment of the machine on which you install the TT Gateway, you may receive several informative or question prompt boxes. If a task discusses such a prompt box, and you do not receive the prompt box, skip to the next step. Disable User Account Control: You must disable the Windows User Account Control for the LSE Gateway to properly function. The User Account Control prevents the gateway from updating files, including changes to the aconfig.xml file and updates to the product table. Run the LSE Gateway setup. 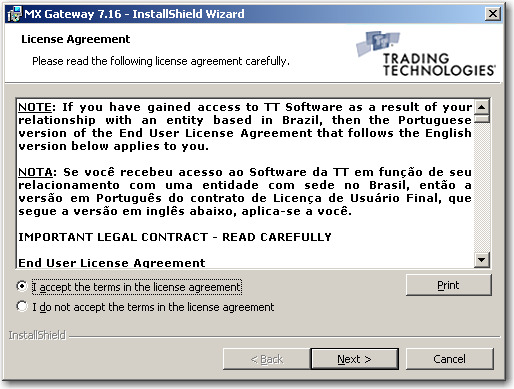 To accept the license agreement and continue with the installation, select the box next to I accept the terms in the license agreement and click Next. If this is the first TT product installed on this machine, the Install Now option installs the LSE Gateway to the c:tt directory by default. If the installation detects previously installed TT products, the Install Now option installs the LSE Gateway in the same directory as your other TT products. To install the LSE Gateway into the default directory, select Install Now and click Next. Skip to step this step. To install the LSE Gateway in a custom directory, select Customize and continue with the step below. If this is the first TT product on you TT Trading System, continue with next Step. If you provide an aconfig.xml file, go to this step. A Continue Without Providing File prompt appears asking you whether you want to continue. Click Yes, and go to Step this step. Your LSE Gateway installs with its customized aconfig.xml. For information on how the TT system replicates aconfig.xml across your TT system, refer to the TT Gateway Architecture SAM Version 7.X. Double-click the file, and then click Next. The Available Exchange Names dialog box displays with a list of LSE flavors (i.e., exchange-flavors). Click the exchange-flavor that you want your TT Gateway to display in Guardian. Select the same exchange-flavor that is listed on the TT license file. To trade on the TT Gateway, traders must log into this TT Gateway exchange-flavor. This exchange-flavor appears in Guardian’s tree of exchanges. The InstallShield Wizard reboot dialog box appears. To complete the installation and reboot your machine, click Reboot Now. To exit the installer and reboot your machine later, click Reboot Later. TT recommends rebooting your machine prior to operating the LSE Gateway.